If you are prescribed an injectable drug that you need to take on a regular basis at home, you will need to buy needles and syringes (clear tubes that hold the medication) to administer your shots. Choosing the right size needle and syringe is important to get the correct dose of medicine, injecting it properly, and minimizing pain. That's why these items are sold separately and designed to securely attach to one another. While your doctor or nurse will provide you details of how to administer your injections at home (including which syringes and needles to use), it helps to understand some basic principles about needle and syringe sizing so that you avoid errors when it's time to replace them. Syringes are labeled based on how much liquid they can hold, and there are different ways in which syringe capacity can be measure. Syringe capacity can either be labelled in milliliters (mL), the term used to describe liquid volume, or cubic centimeters (cc), which describes the volume of solids. Whatever measurement is used, the volume is the same: 1 cc equal 1 mL. If you will be injecting a medication at home, you need to make sure that you select a syringe that will hold the amount of medication you've been prescribed. For example, if you're supposed to give yourself 3 cc of a drug, you should be sure to get a syringe that holds exactly 3 cc or just a little more than 3 cc. If you use a syringe that holds only 2 cc, you would have to inject yourself more than once, which is unnecessarily painful. On the other hand, if you use a syringe that holds 15 cc, it can be hard to see the markings at the cc markings with accuracy. In such case, you could easily end up giving yourself too little or too much medication. Needles are labeled differently than syringes. The packaging will have a number, then a "G," and then another number. When determining needle size, note that the first number in front of the letter G indicates the gauge of the needle. The higher the number, the thinner the needle. The second number indicates the length of the needle in inches. For example, a 22 G 1/2 needle has a gauge of 22 and a length of half an inch. If you will inject yourself with a small amount of medication, a thin, high-gauge needle is fine and should cause less pain than a wider, low-gauge needle. For larger amounts of medicine, however, the latter option is better. While it may cause you more pain, it will deliver the injection far faster than a thin, high-gauge option. If you have smaller-than-average veins, you may need a thinner needle. As far as the needle length, the best choice depends on the size of the person. A young child would need a shorter needle than an adult, for example. It also depends on where the needle needs to be inserted. Subcutaneous injections go into the fatty tissue just below the skin. Since these are relatively shallow shots, the needle required is small and short—typically one-half to five-eighths of an inch long with a gauge of 25 to 30. Intramuscular injections go directly into muscle. Muscle is deeper than the subcutaneous layer of skin, so the needle used for intramuscular injections must be thicker and longer. The size needles that usually are best are 20 or 22 G needles that are an inch or an inch-and-a-half-long. For these injections, you must pay attention to the amount of body fat the needle has to go through. Someone who's thin can usually use an inch-long needle, while a person who's on the heavier side may need to use an inch-and-a-half-long needle. 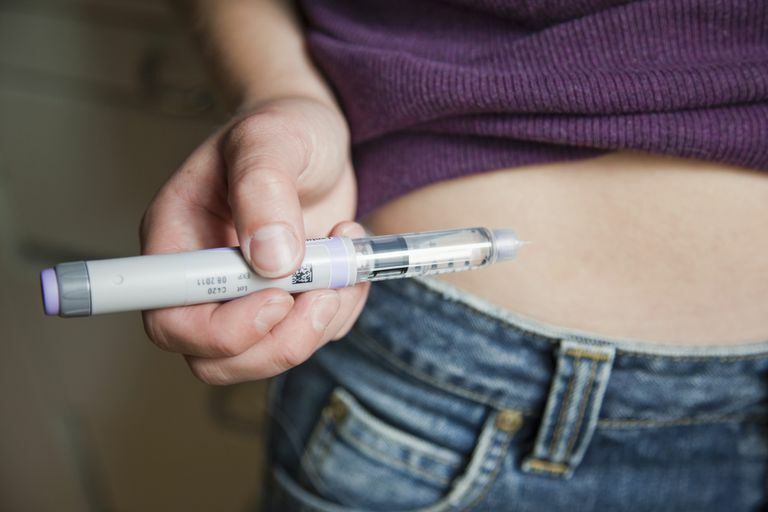 There are a number of medications that you may need to inject at home, including fertility drugs, vitamin B12, hormones, insulin, cancer medications, and epinephrine for an severe allergy reaction. You might need to administer the medication to yourself, administer medication to a family member, or you may need to have a family member learn how to inject you with your medicine. The most important thing to keep in mind when you need to give yourself or someone else an injectable medication is that the prescribing medical professional undoubtedly welcomes questions if you get stuck figuring out which size needles or syringes to use or how to use them properly. Shemesh E,D'Urso C,Knight C et al. Food-Allergic Adolescents at Risk for Anaphylaxis: A Randomized Controlled Study of SupervisedInjectionto Improve Comfort with EpinephrineSelf-Injection. J Allergy Clin Immunol Pract.2017 Mar - Apr;5(2):391-397.e4. doi: 10.1016/j.jaip.2016.12.016. Epub 2017 Jan 20.